The Japanese card of the day for February 25th is a first vanguard four years in the making, the Legend Deck grade 0 Fullbau Brave. 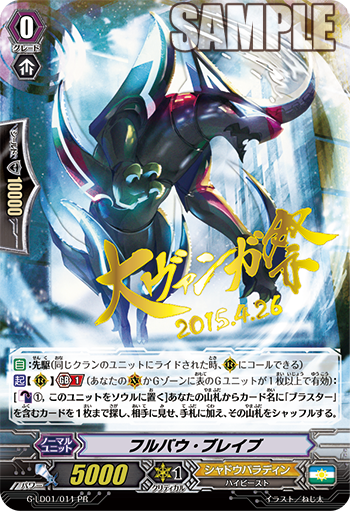 Both a remake of Shadow Paladin's original FVG and a long-awaited counterpart to Wingal Brave from BT05: Twin Swords Awakening, 2015's Fullbau is a Blaster series support card like his original incarnation. Yet while the first generation Fullbau could only search for Blaster Dark under very specific criteria, the fifth generation Fullbau's skill opens up many different options by pulling out any Blaster unit to alternatively support crossride, field control, restand, soul or stride-based strategies. 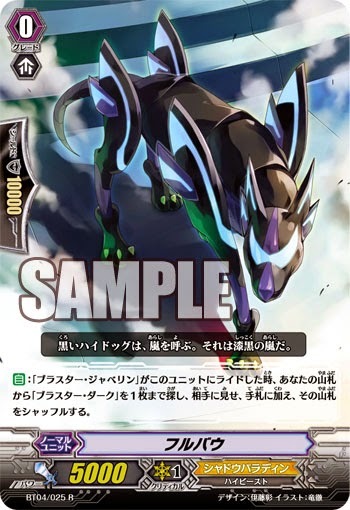 ACT (Rearguard circle): Generation break 1: (Active if you have 1 or more face-up G Units in your vanguard circle or generation zone) [Counterblast 1, put this unit into your soul] Search your deck for up to one card with "Blaster" in its card name, reveal it to your open, put it into your hand, and shuffle your deck. While this skill is slower and more costly compared to Wingal Brave, it's also not an on-hit skill and can be used to facilitate true control over the fight. Even among Revenger cardfighters that would be unlikely to abandon Judgebau's double Sword-breaker combo, Fullbau Brave gives an advantage; Brave players that can defend through their opponent's initial Judgebau turn can then stride and immediately use Brave to search for Blaster Dark Revenger “Abyss” and then use “Abyss'” counterblast 1 to retire Judgebau, indirectly turning the Sword-breakers in their deck into vanilla units. On a grander scale this kind of direct counter may not be necessary. The presence of Grim Recruiter in the format inherently decreases dependency on Judgebau to get those cards into play, making room for Fullbau to ensure multiple Grim Recruiter turns that will push the midgame. The other options that Brave brings to the table include being able to search for Blaster Dark “Diablo” to correct an opening ride, searching for copies of persona blast-based Blaster units like Phantom Blaster Overlord, and more pertinently searching for a Phantom Blaster “Abyss” to secure a restand with. Revenger decks are capable of easily unflipping using Barrier Troop Revenger Dorint and the original Blaster Dark Revenger, so that Fullbau Brave's cost is entirely reasonable within the subclan. 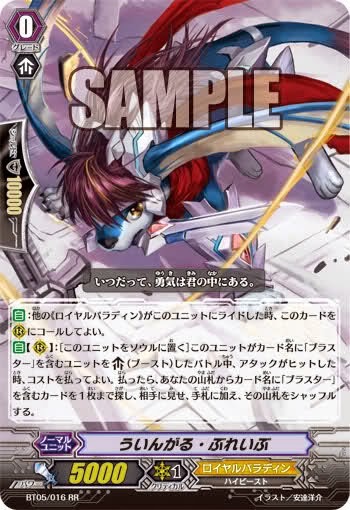 Brave's skill can also be used to search for a Blaster unit to put into the soul with Nightmare Painter for Gust Blaster Dragon, or to search for Gust himself after riding the original Phantom Blaster, but Judgebau is arguably better for this because he can search for the actual Nightmare Painters to get multiple Blasters in the soul in a single turn. Although some Royal Paladin cardfighters will doubtless turn their eyes to using Fullbau to support their own Blaster decks, all professional tournaments in Japan currently prevent this due to the onset of Clan Fight regulations. Under these regulations, cardfighters may not integrate multiple clans into a single deck; even Royal Paladin fighters can only use up to four of the original Blaster Dark for Majesty Lord Blaster's skill, while Link Joker users can only access “Я” cards. Fullbau Brave's gold calligraphy edition will be presented to attendants on the second day of this year's Great Vanguard Festival in Japan. The Legend Deck edition will have standard flavor text, but a triple rare foil.